Great Fringed Orchis. Platanthera Fimbriata, R. Br. Natural Order, Orchidaceae. 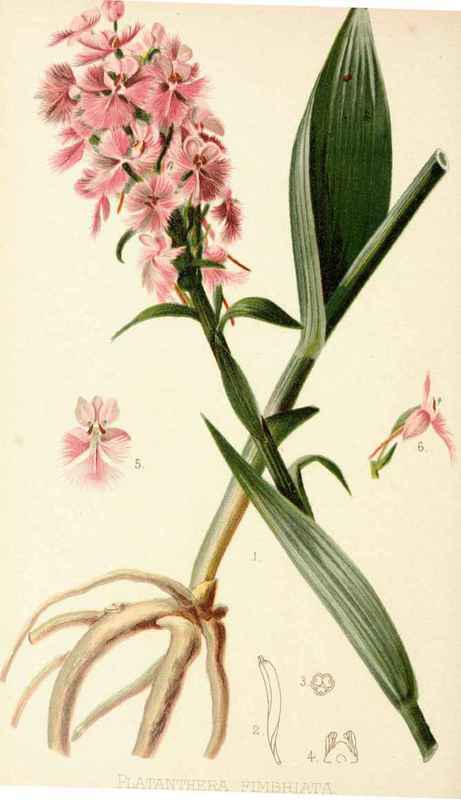 THE early American botanists found great difficulty in studying orchideous plants. Muhlenberg, one of the earliest, writing to William Bartram in 1792, says to him that he could never satisfy himself about Orchis, Ophrys, and some other genera which he mentions, because, as he continues, "they are so badly described in some, and have too many species in others. I intend to transcribe my descriptions for your perusal and criticism by and by, and hope you will assist me in clearing up some of the rubbish. "We in modern times, when we have so large a list of names to choose from, can appreciate the labors and troubles of our forefathers, for in the cases of most Orchids there are long lists of synonymous names which have been given to the same thing by different authors at various times. With the botanists of the past age our plant was Orchis fimbriata, and since that time it is Platanthera fimbriata, or Habcnaria fimbriata, according to the different views of authors, setting aside other names not so well known. The modern distinction from the true Orchis consists chiefly in the anthers being covered by a pouch in the latter genus, while in Habcnaria or Platanthera they are naked, as we may see in our enlarged Fig. 4. Dr. Gray, to whom we have made our leading reference, unites Platanthera with Habenaria, as he docs not regard the separating characters of full generic importance. The leading difference is that the two glands are approximate in the one section, and widely divergent in the other. There is, however, so little natural distinction between these and several other genera from the true Ore/it's, that most authors have to explain the reasons for the adoption of the several designations, and each branch of the Orchis family may feel a pride in the family history of the ancient name. Our species, indeed, approaches in general aspect many of the European species that have made their mark in the pages of polite literature. Thus in "Hamlet" the queen describes the manner of Ophelia's death, and says, " There is a willow growing o'er a brook, That shows his hoar leaves in the glassy stream, Near which fantastic garlands she did make Of crow-flowers, nettles, daisies, and long purples," which last, she says, are also called "Dead Men's Fingers." "Long Purples" and "Dead Men's Fingers" were common names applied to many species of the genus Orchis in England, but little different in appearance from the one illustrated here. Our species has not a root quite so characteristic of a "dead man's fingers" as some of the English ones which suggested the name; but as we see in our Fig. 1, there is enough resemblance to claim association with the original idea. Rev. Mr. Ellacomb, writing in Mr. Robinson's "Garden," shows that the name, in allusion to the death-like flesh of the roots, is of great antiquity. He quotes an old ballad as follows: "Then round the meddowes did she walke, Catching eache flower by ye stalke, Such as within the meddowes grew, As Deadman's Thumb and Harebell blew; And as she pluckt them, still cried she, ' Alas ! there 's none e'er loved like me.' "
In our country the former botanical name, Orchis, has been adopted in popular parlance; hence this species is known as the "Great Fringed Orchis," and by no other name that we are aware of. There are many interesting features in a study of this species. The long slender spur which we have endeavored to show in Fig. 6 is characteristic of many species of the genus, and suggested the name Habcnaria, from habcna, which is Latin for the round leather leash of a whip, or part of the reins or harness of a horse. Platanthcra, the generic name, is from the Greek, signifying "broad anthers," from the divergent cells of the anthers, as seen in'Figs. 4 and 5. The insectiform look of the flower (Fig. 5) is very interesting; but the most striking feature is seen in the two eyes of a moth or butterfly, which are suggested by the divergent anther-cells. The petals also are peculiarly interesting from their great dissimilarity. The Orchid flower is formed on a ternary type. The lower verticil is composed of a whorl of three sepals, and the upper of three transformed leaves or petals. In our Great Fringed Orchis we see that two of the sepals are nearly equal and opposite to each other, while the third of the series is at right angles with them, and smaller, as we see through the two upper petals. But the three petals, or upper leaves, are still more unequal than the three lower, or sepals; and we see that they have been twisted so that the two conforming ones are on the top, while the more isolated one takes the lower place, and becomes the "lip." In its isolation it has, however, become the largest instead of the smallest, as is the case with the odd one in the lower series, and has so divided itself that it appears as if made of three distinct leaves or petals, and each of these lobes, with its fringed edgings, seems to have a separate existence of its own. The form of the Orchid flowers is so much out of the usual course of nature in flowers, as sometimes to be thought difficult to study, but if we get down to the foundations of the structure, and understand the plan on which the flowers are built, few will be found that are easier. In order that the student may still better perceive the ternary plan on which this Orchid is formed, we give in Fig. 3 a cross section of the ovary. If we examine the stem, we find the leaves scattered thereon. In the stem growth there has been a gradual elongation, but we see that it takes but three leaves to make a full circle round the stem. We do not notice indications of the spiral growth which takes these leaves round the stem, but it is there. It is the more sudden twisting and arresting of the elongating growth that make the set of three sepals and of three petals. These lengthenings and twistings do not go on with regular intensity, but as in waves, sometimes fast and sometimes slow. Such varying intensity and sudden change of degree cannot be seen in many flowers; but this Orchid, as well as some other species, gives a good opportunity for observing it. If we watch the growth of the flower we shall find that it first makes a slow, elongating growth, and that the twisting comes on suddenly, usually taking but a few hours to make a half-turn. In Fig. 2 we have shown an almost mature seed-vessel with the twist towards the base. The torsion in the ovarium is also shown in Fig. 6. The Great Fringed Orchis seems to have been first made known to botanists through Dr. Pitcairn, who introduced it from Newfoundland to the Kew Gardens in 1777, and it was named Orchis fimbriata by Willdenow twenty years later. Its best home is still found to be in the northeastern portion of the United States. It extends westward from New England to Michigan, being quite a common Orchid in the latter State. In Northern and Central Ohio it is also common, but is found more sparingly in the southern part of the State. In Pennsylvania and New York it is found chiefly in the higher districts, becoming scarcer as it reaches lower elevations. In New Jersey, which in many respects is the home of Orchidaceae, it is found only in the more hilly localities in the western part of the State. Our specimen is from Massachusetts. 1. Whole plant with root and hollow stem. 3. Transverse section of the same. 4. Divergent gland of the anther-cells. 5. Full-face view of single flower. 6. Side view of flower. prev: Nevius' Stone-Crop. Sedum Nevii, Gray. Natural Order, Crassulaceae. next: Floating Heart. Limnanthemum Lacunosum, Grisebach. Natural Order, Gentianaceae.